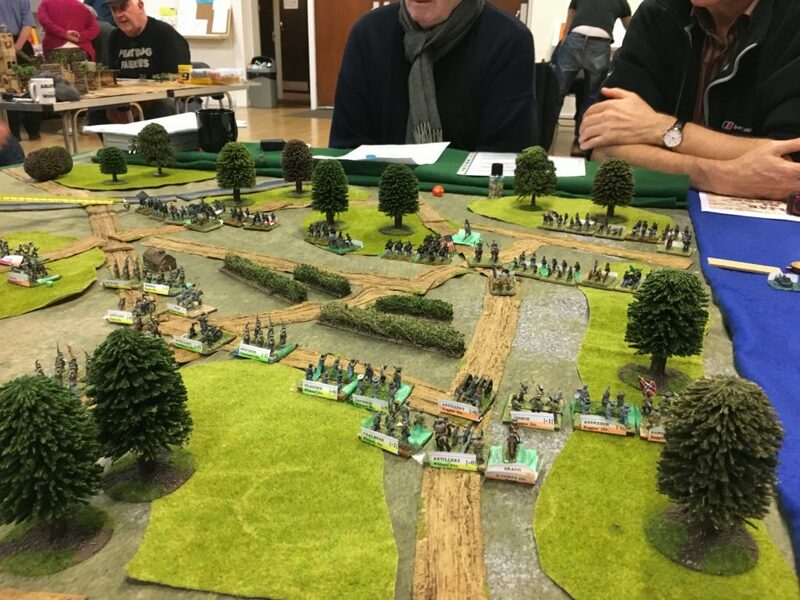 Last night I played another game at the club with my Napoleonic Prussian and French armies using my version of Bloody Big Battles. This was a totally made up scenario with two corps on each side. Two were about to be locked into a contest for a stream and bridge. Two more started some distance away and had to choose what would be the most effective way to support their colleagues. We had four players. My fellow gamers are getting used to the system, and doing more themselves without me needing to help them. This is gratifying. They also quite like the system: even better. We got through about five turns, as last time. The game probably needed another turn to come to a decisive conclusion. However, the French were weakening and had used up their reserves, while a fresh Prussian Brigade had appeared in their rear. They were the weaker side and perhaps I should have given them a bit more – cavalry perhaps. The scenario worked well. The gaps between the corps at the start meant that the players had to make some quite difficult choices about closing gaps and leaving flanks open. Different aspects of the rules were tested this time. Partly due to the way I set things up and nudged them (I was games master for most of the game), skirmishers were used much more than last time. They did what they were supposed to, shielding the main bodies from disorder and taking the early strain in fire duels, but I don’t think the players find that their use comes naturally. It isn’t clear to them when they should deploy skirmishers and when the shouldn’t. The skirmish bases are also a bit messy when not deployed. I think the system needs a redesign of some sort, but I’m not yet clear on what. We also played the rule on supporting artillery quite a bit – and that largely worked as intended. There was no cavalry versus infantry combat though, and no use of the square formation. The cavalry on both sides cancelled each other out. I am continuing to leave the system unchanged for now. I need to get a better idea of how to take skirmishing forward before making a move; I need a system which makes choices as to their deployment more natural. My thoughts on tweaks of other rules from last time mainly stand. The most radical thought I have had since is to create an idea of “hits” to reflect losses. 3 hits mean a base removal. Perhaps 1 hit happens whenever there is a disorder result from fire or assault combat. This would allow cumulative casualties to be reflected better, and is an alternative to the idea of “double disorder”, as disordered units can take hits. It would also help for cavalry vs. cavalry combat, where there is a lot of back and forward without any cumulative effect. A less radical idea is to reinstate the rule in main BBB that skirmishers are the first base to be removed. This helps tidy things up if nothing else. Last night we did another Iron Cross game at the club, using the latest adaptation of my house rules. It was pretty much a repeat of the previous scenario, which we played way back in October, before my travels, Christmas and flu intervened. We had four players and I games-mastered. This was version 1.1 of my house rules. These are actually slightly shorter than V1.0 we used last time, as I reverted to the original rules for buildings and the indirect fire rules were a bit simpler too. They still tipped into 8 pages though. The game, using mainly my figures and vehicles for 1943 Italy, moved a bit faster, though we only completed three turns. The Germans tried to move too many of their forces forward at once, which did not leave them with enough command points to do the fighting, or to penetrate deeper into the British territory. Their tanks got badly mauled (three knocked out, two badly damaged out of six tanks), even before the British tank reinforcements arrived, while they only managed to knock out one M10 in return. The infantry cleared the wood next to hamlet that was the objective, without much loss (and destroying one of the British infantry sections), but hadn’t really got stuck into the main British position. How did the adapted rules fare? Only the mortar fire rules got a serious test: they turned out to be a bit too effective, but that was mainly because as games master I was a bit too generous with “speculative” firing at unseen targets. On reflection I think all fire must be directed at seen targets, with maybe an exception for game objectives. Smoke would be the exception. There were a couple of attempts at close combat, and I think the “super-activation” idea works better than my previous two-step one. A couple of the issues that I mentioned last time raised their heads. The firing rules are a faff and not very intuitive. By now the players should be getting the hang of it and able to resolve things with a quick reference sheet. The other is that cover doesn’t seem to offer infantry and support groups all that much protection. Both are core Iron Cross rules, which I’m loth to fiddle with. But the grey cells are working on it. But the biggest problem is that we are all in the early stages of mastering how to play the game. Holding reserves, retiring to regroup, passing the initiative are all plays that should be made more. The command rules (for example with one re-throw per turn) need to be brought in. I only discovered how useful the fall back rule is at the end of the game (I took over the German armour, which desperately needed to regroup). I should be trying to push all this onto my fellow gamers – but the truth is that I’m on a learning curve myself. But generally they seem happier with this game than with Rapid Fire, so there is plenty of scope to keep going. I need a new scenario though. This one is now stale. Meanwhile I’m very tempted to devise a WW2 system based on the Fire and Fury move system (used in BBB). I have taken this on in a little rule-writing project – but this for a battalion level game, and one that doesn’t pretend that platoons are individuals. That’s very different from Iron Cross, which is an unashamed company game, where at least the tanks are scaled 1:1 – though not a true skirmish game like Chain of Command. We tried out my rather extensive house rules for Iron Cross, the WW2 system, last night at the club. It was an attack defence games, using the game’s hidden deployment rules. It was also an outing for quite a few of my 1943 20mm figures and vehicles, since the person with Normandy ones I had planned to use was ill. Verdict: my gaming friends like the system, but my adaptations need more work. In my scenario the British were defending a two building farm with an infantry platoon, supported by a mortar, a Vickers machine gun and a six pounder. A separate command was in the rear to offer support, consisting of an M10 and Sherman at first, plus a further three Shermans on Turn 3. The Germans were attacking with two weak infantry platoons (3 sections each) with a pair of mortars, and two tank platoons, one of Panzer IIIs and one of Panzer IVs. I had originally planned to use two Panthers in place of the Panzer IIIs, and for one of the German platoons to be mounted in halftracks, and for the British to have 2 M10s and one Firefly along with two Shermans. But without Bernie’s stuff I had to make substitutes. I did have Tigers available for the Germans, but I thought that would unbalance things a bit, even with just one, without any very strong antitank guns on the other side. We didn’t get very far, declaring a draw most of the way through the third turn out of what was supposed to be seven. The German armour had fared badly: they lost two Pz IVs and one Pz III as the British opened up on them from concealed positions. Their infantry were slow to get stuck in, but once they did they were making steady progress. All the British armour was still in play, but could it rescue the beleaguered infantry in time? The first point was that we were slow. according to the rule booklet we should have had time for that size of scenario, as we had four players. I think there was quite a bit of learning curve, but moving each init one by one does make a much slower game the Fistful of TOWs, which we use for micro armour. But it creates a more engaging game. I had each player operating a separate command with two extra tokens, which may be a bit generous – though it did help recreate patchy cooperation between infantry and armour, which is what I hoped. But I’m hoping that we speed up quite a bit. On the rules, I think the concealed deployment worked well. I’m sure my simplified firing rules speeded things up, though each firing usually involved two dice throws, and sometimes three. That is part of the core system, so I hesitate to fix it. My indirect fire rules, which we used for mortars, were not particularly intuitive, though the fire was a little less accurate than I thought. The game’s original system isn’t particularly intuitive either, so that’s no great loss. The spotting phase was an extra faff, and could be dropped – but I think this was an important part of how things actually worked. However, we could just go straight to the placement of the marker without the placement throw, once the spotter is activated, and leaving the vagaries to the actual firing. That would cut a dice throw. We also need to be a bit sharper in deciding where a unit is for the purposes of near misses – is the the centre of a section, or the nearest figure? If the latter, then it could lead to a bit of gamesmanship. Mortar fire wasn’t that effective though – perhaps because there isn’t the automatic morale marker for each hit. The bit of the rules that my fellow players weren’t happy with was close combat, which arose when the infantry attacked buildings. The separate morale test, which doesn’t play until the assault phase looked unrealistic. Also my attempt as treating buildings as terrain units, rather than just areas of rough terrain (as the main rules do), was clunky, especially with the rather large building models we were using. The morale test stage needs to come at activation, not later. The buildings rules need to be rethought. I’m tempted to go back to the original, albeit with clearer guidance, rather than create a whole new structure -as this wasn’t an aspect of the rules that received much criticism. One other aspect surprised me – that cover seemed to be relatively little use, especially against infantry weapons. This aspect is largely in the original rules, though. Cover doesn’t affect the to-hit throw, and the first morale marker is automatic regardless of cover. Of course troops in cover are as liable to being suppressed as those outside, so there’s some logic to this. But both the 6 pounder and the Vickers gun proved quite vulnerable with a morale rating of just 3. Since this looks like core rules I don’t want to think about fiddling with it until we have started to learn the system better. And that’s important: it takes a bit of experience to use the rules well. I started to learn that pulling back vehicles into cover after they have fired is useful. This is especially true of vehicles like the M10, which usually don’t last very long on the table because of their thin armour. But classing it as “light” so that it can react better starts to make sense – and you have to deploy it where there’s cover to dodge back into! In fact I forgot to make use of this “light” rating -but then I was also too generous with moving and firing – it should have been 2 off the to-hit throw rather than 1. Finally there is the issue of scenario design. The attack-defence game format was much more fun than the encounter battles we have tried before. I also thing that keeping armour and infantry in separate commands works well in recreating the difficulties of cooperation between the arms – though this was more of an issue for the Allies than the Germans. In the scenario design this included separate break points. One more lost tank and the German armour would have pulled out! Another aspect of the scenario to think about is terrain. This worked well enough last night, but I did spend quite a bit of time thinking about it first. One nice feature of the attack-defence format is that the defender has a greater depth of terrain to play with, so the action is spread across more of the table, rather than being a punch-up in the middle. One idea I have for the future is to design scenarios specifically for use with reconnaissance forces. Smaller numbers of lightly armed, but mobile forces on the attack, with spread out defenders, also relatively lightly armed and a fire brigade of some sort. I need to work on the vehicles though! This is an utter disaster of a book. I was very critical of Paul Dawson’s companion book on Quatre Bras, but I started this one on the main battle of the campaign more hopefully. But that wasn’t to last. 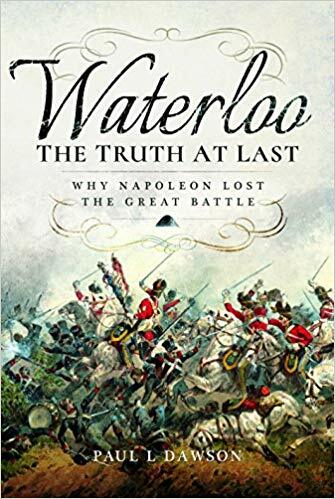 I have gained a few new insights, but I would only recommend this book to Waterloo fanatics who don’t have a blood pressure problem. Mr Dawson’s claim to have found the truth rests on some new data that he has unearthed in 2016 from the French archives, with unit rolls and casualty reports. The best bit of the book is the Introduction where he explains what these are and what he did with them. If he had confined himself to presenting this material along with some basic interpretation, then this would have been fine. Alas he wanted to write a much bigger book in too short a space of time – a task that would have defeated a more talented writer than Mr Dawson. What to say? Based on another book I have been reading, it is a very left-brained affair. Right-brained skills of common sense and grounding in context are absent, as is any empathy for the reader, or anybody else. There is a lot of formulaic repetition, and the book is padded out with short biographies of the French participants that really don’t tell you very much at all. A few of these would have provided a bit of colour: repetitive lists should be in an appendix if they are to anywhere, rather than interrupting the main text. A lot of his conclusions look very shaky. For example he rightly puzzles about the high casualties suffered by Donzelot’s division in d’Erlon’s corps. He points out that it was not hit by the cavalry charges which destroyed Marcognet’s division – something that I did not know, but for which he provides compelling evidence. He then assumes it must have come from attacks on the farm of La Haye Sainte. Elsewhere he criticises historians for describing the battle for Hougoumont as a version of Rourke’s Drift. But if he’s right about Donzelot, the battle for La Haye Sainte, was a Rourke’s Drift with muzzle-loading muskets and rifles in place of the Martini-Henrys. In fact the issue is mainly to do with large numbers of men posted as missing – and I suspect this has something to do with being caught by the Prussians at the end of the battle while the French army was disintegrating. That’s just one example of how he makes breathtaking leaps to conclusions, while criticising others for wandering beyond the evidence. Alas weak analysis and loads of extraneous data are far from the only problems. There appears not to have been an editor. This is not something publishers do these days, so authors have to rely on their own self-criticism and make use of friends. But Mr Dawson doesn’t seem to be a good self critic, and probably was in too much of a hurry to allow friends to do much editing. The book is disorganised (the chapter heads are random), riddled with errors and in places incoherent. There are many quotes, which Mr Dawson mostly leaves uninterpreted (he said something somewhere about letting them speak for themselves). Often these are in the wrong places, sometimes they appear more than once, and frequently it isn’t clear how he draws the conclusions from them he does. And much of the analysis is contradictory. For example he bangs on quite a bit about how Lobau held off the Prussians for hours near Frischermont, before later concluding that he must have retreated rather rapidly, given his low casualties. There are no maps. Maps are more than just a decoration. They make things much clearer for a reader and force authors to face up to contradictions in the evidence. This failure is evident in his extremely confusing account of the Prussian advance to Plancenoit. Contrast this with Mark Adkins’s account (which Mr Dawson likes to pick holes in), where maps are central to the narrative, and he presents a clear account of the same episode. Of course, trying to put together a clear account of this complex battle with its many contradictory sources, with maps, and disciplined editing takes time – and this work was published not much more than a year after its central research. So he should have attempted something much less ambitious. So what were the useful bits? The new data clearly has value. But it is problematic. The casualty data was compiled in chaotic conditions after large numbers of men had deserted, and others and had been rounded up as prisoners. There are large numbers of missing. So it is very hard to separate the battle from the aftermath. Mr Dawson does try to take this on, but not very successfully. The most useful thing I learned was about d’Erlon’s first attack. I have already mentioned that he shows that Donzelot’s division was not broken by cavalry at this time, which almost every account I have read has suggested. The data also help clarify what happened to the other divisions. This is very helpful. When devising wargames rules, I keep coming back to this episode to see how well any new system copes. That it now appears that the three regiments of the Union Brigade concentrated on just Marcognet’s division (and then moved on to one of Durutte’s brigades) makes much more sense of things. Another valuable insight comes at the end of the book when he looks at the data on the level of experience of the French army. He convincingly shows that it was not composed largely of veterans – but was comparable in experience to the Prussian, Netherlands and Hanoverian contingents (and unlike most of the British, which were in true veteran formations). The Guard seems to have been a shadow of its former self. This is contrary to what many historians have claimed, but does help make sense of both Waterloo and Quatre Bras. I am also a bit clearer on what happened at Hougoumont, where the involvement of the different French regiments was very variable; not all of them seem to have been fully committed. That’s about it. I am left with a number of mysteries. First and foremost is the advance of the Prussians. I really can’t make sense of the sequence of events – though Mark Adkins’s version looks entirely plausible. I want to do more work on this, and maybe I will find some nuggets if I trawl back through Mr Dawson’s book. But the absence of evidence from the French side must itself be quite revealing. I haven’t been able to find much from the Prussian side either – and Mr Dawson doesn’t seem to have bothered much with the Prussians, in spite of lecturing us on how important this episode was to the whole battle. This runs alongside the other big mystery of the campaign, which is why the Prussians did so badly at Ligny. One theory, that the French had tougher, more experienced troops is now looking shaky. Back to Waterloo another mystery is why Bachelu’s attack was beaten back so easily. Mr Dawson makes a big deal on how this episode is overlooked by historians, but doesn’t throw light on how the whole division appears to have been beaten back by four battalions of the KGL in square formation. One theory is that they had been messed up by the fighting in Quatre Bras – but in his other book Mr Dawson suggests that they were not as heavily engaged as many thought. Perhaps they were low on ammunition? Waterloo is the gift that keeps on giving. You would have thought that after all this time we would be quite clear on what happened. Alas no. This book offers some new evidence, but isn’t worth over 500 pages. Following my last post, I have produced a new edition of my house rules for Napoleonic wars on the Rules Page. The modifications are now quite extensive, so I have produced a set of design notes to go with it. 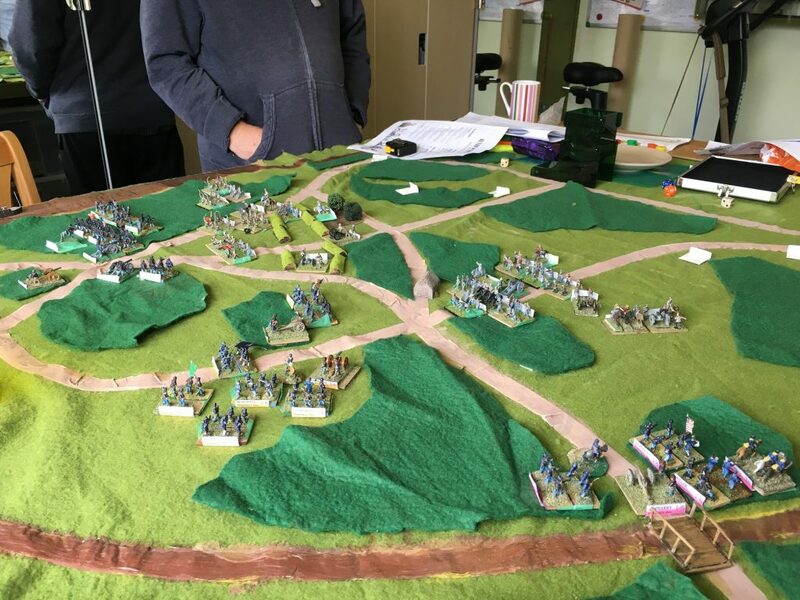 Last Monday I ran another club game with my Albuera scenario transposed to Franco-Prussian 1815, where we used these rules. We lasted 5 turns and did not have a decisive result, again. I will need to try other scenarios, but this is clearly a problem. The battles are going on for too long. The extra attrition in infantry combat isn’t having the hoped for effect. Too often infantry is held back. I’m not sure what the answer is. Corps break points would be one approach. In this battle one Prussian corps took almost all the strain, while the other lurked in the background, apart from its cavalry. It was nearly wiped out, but still held on for four turns. Perhaps they should have been treated as fragile as well as Raw – though I don’t think that properly applies to the Prussian originals. I don’t want to introduce such a radical change, though. For now I must think more about scenario design. Otherwise I think the rules worked pretty well. My fellow players complained that artillery was rather ineffective. But, faithful to the original Albuera, there wasn’t that much of it – two or three units a side. I think the extra flexibility of artillery movement worked well. Replacing Out of Ammo and Silenced with Disrupted worked well, as did the elimination of half-effect firing. I’m not entirely sure about the new cavalry-infantry combat rules, as they weren’t fully stress-tested. But they induced the right sorts of responses in players. I am cautiously optimistic. On the other hand I am very pleased with my skirmisher rules. Within the limits of BBB mechanisms they work well. Players are being forced into realistic choices – which are important but not too important. One issue that I probably want to fix in due course is the rules on squares. At the moment the squares behave in combat much as normal formations: they still have flanks for infantry attacks, and there is no all round firing. This is not how players instinctively feel how squares should work, so there is too much that is counter-intuitive. I also think movement restrictions could be clearer. But I don’t want them to be used to provide all-round defence against infantry. I think all round firing could be put in (remembering that it is reduced effect) and the Depth formation in square could have safe flanks against infantry attacks. I have come across an old scenario book for Shako rules. these look about the right size for the smaller games I want to put on – and I think I can adapt them. And there are two specifically for 1815 Prussians (Wavre and Planchenoit). I am also thinking of trying Shako out itself! 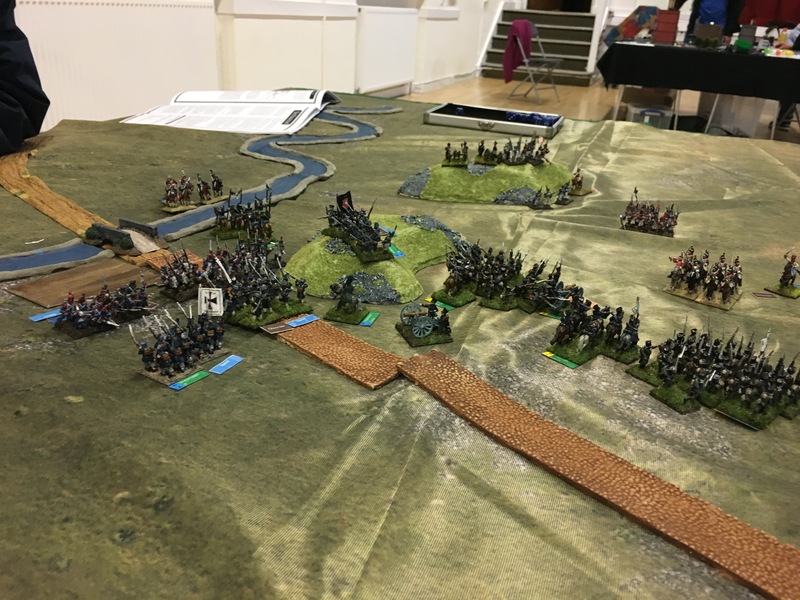 Last night at the club I tried out my new house rules to convert Bloody Big Battles to Napoleonics, using a smaller scenario. This was a success, though I will tweak the rules some more. The scenario was loosely based on Albuera (1811 in the Peninsular War), but using my 1815 Franco-Prussian armies, so that I did not have to print new unit labels, as well as getting more feel for how these armies work. On the French side I had four standard 4 base infantry units of Veteran line troops. Two of these were assigned to the flank march, one to the pinning attack and one to the reserve. In support were three cavalry units. One light cavalry unit (3 bases) supported the pin attack, while a further one (using my Polish lancer figures) combined with a cuirassier unit of 4 bases to support the flank attack. They had three artillery units: one field unit for the pin, one further field unit and a horse unit for the flank attack. There were two generals. One overall (Vandamme taking the place of Soult) and one for the cavalry (Grouchy taking the place of Latour-Maubourg, though in 1815 he was the senior officer). The Prussians had two corps. One, to take the place of the Spanish, had three 4 base landwehr infantry units and a 3 base landwehr cavalry unit and a field artillery unit. To take the place of the Anglo-Portuguese were two 6 base line infantry units (Trained) and a 4 base dragoon unit, also with artillery. The Prussians were classed as Passive. This is hardly an exact correspondence on the Allied side (given that the British had the best infantry on the field), but the overall challenge remained similar. The terrain available for a club night encounter was very approximate. The scenario worked fine. Doing proper historical scenarios, as envisaged by the creators of BBB isn’t really feasible for a club night. They tend to be too big, and there isn’t a good way of getting the terrain relief right – real terrain is subtle and flowing; club hills are blobby – and most gamers don’t actually bother with them, using other terrain features to break things up. Since hills are probably the most important aspect of terrain militarily, this is a pity, if understandable. Also getting the armies right takes quite a bit of prep. But you can’t beat a historical scenario for creating a narrative and interest. So my compromise is to use real battles for game purposes drawing units from historical armies, but not those f the battle itself. We didn’t quite finish this one, but we started late, and there were only two and a half of us, instead of the usual four. So the size was about right, until we speed up. I need to find a few more battles of this sort of size. How did it play? Terry did not follow the historical precedent. He immediately threw the reserve division into the frontal attack, turning the pinning attack into the main deal. On the flank he set up his artillery to play on the allied units, pushed his cavalry towards the Allied rear, and held his infantry back. The Prussian regulars moved to handle the flank attack, while the landwehr dealt with the frontal attack. In the former case the dragoon unit did most of the work. It did sterling service, beating off a combined attack from the two French units, and with some help from fire support, destroying the lancer unit. At the end the French cuirassiers were in the Allied rear, but allied dragoons were still facing them off. The regular infantry allowed themselves to be pinned by the cavalry, but took up the challenge of the French infantry when it eventually advanced. This infantry battle wasn’t resolved at the end of Turn 5 (or 6) when we called it a draw. Meanwhile the French frontal attack was slowly grinding down the landwehr after capturing the village, though at the cost of being neutralised itself. The landwehr cavalry managed to neutralise the French cavalry, using the stream. So how did the rule modifications play? The most dramatic: the new cavalry v. infantry combat table, and squares. Infantry became fearful of cavalry, and often took up square formation (on the Prussian side), limiting its effectiveness. So it played a bit like Waterloo. Whether this is overdone is hard to test. There were not many attacks by cavalry on infantry, so this aspect wasn’t properly stress tested. I was most nervous about the skirmisher rules, as this seemed to add the most complexity. But they worked pretty smoothly, and it captured the most important aspects. Skirmishers could shield the main body from disordering fire, but also represented a drain on strength. Cavalry was good at neutralising them, giving cavalry a further (and historical) function. 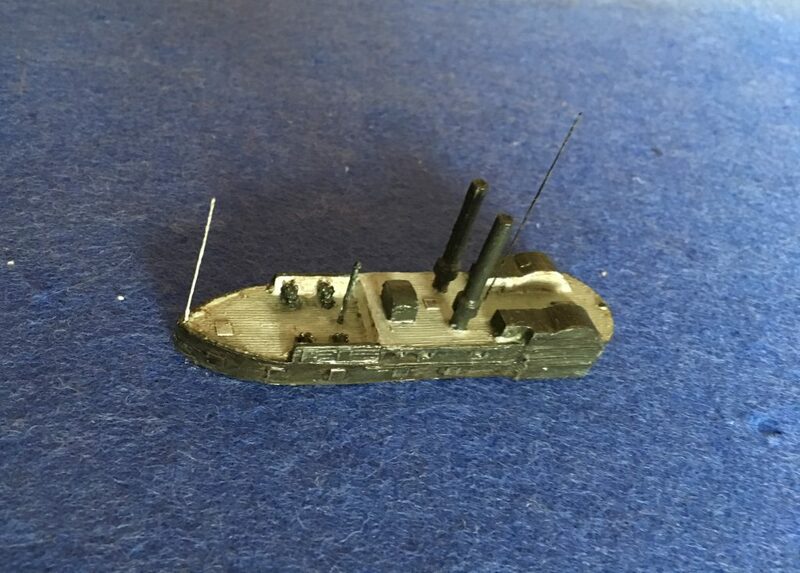 The unhistorical thing is that firing is alternating, which doesn’t capture the mutual attrition aspect of this warfare, where most of the damage in fact arises from fatigue and ammunition loss. That is pretty much baked into the BBB system, though. The new infantry combat table was fairly influential and meant that the French attack on the landwehr progressed more quickly. Again this needs more stress testing, but the early results are promising. Finally the new artillery system, with bases representing smaller units with reduced firepower worked well. Artillery remained influential enough. Replacing silenced batteries with Disrupted ones (like infantry) wasn’t tested, and neither was their vulnerability to charge combat. Artillery was incorporated into supporting infantry units, but this it was difficult to do this while the infantry was moving. In fact in the real battle of Albuera the artillery did keep up with the infantry. So what changes to make? There should be some small tweaks to the skirmish rules. I think artillery movement can be more flexible – and the rules used in Age of Eagles (another system based on Fire and Fury) used, allowing artillery to limber/unlimber and move, or limber/unlimber and fire without penalty in a move (but not move, unlimber and fire). This leads me to a further thought. I have now eliminated all the causes to halve fire points except Disruption and Low on Ammo. Can I find a different way of handling these? Infantry fire with a single point per base; artillery Defensive fire at short range only. And treat Low on Ammo as Disruption instead?. I like ideas that reduce complexity! There is something else, while I think of it. BBB allows for the recovery of bases on the movement throw (though not if Disrupted). This was very important in the first trial game I played (actually based on the 1866 campaign), when an Austrian unit that was badly mauled by concentrated artillery fire, retired behind a slope and mostly recovered. It has almost never been used in my games since, possibly because we forgot to apply it, but mainly because damaged units are in the thick of it and usually start their turn Disrupted. In the Napoleonic era I can’t think of a case where a division got badly roughed up, retired, recovered and went back into battle on the same day (overnight is another matter). Units disintegrated during battle and proved very hard to recover until the end of the day, even when casualties were not that great. It is quite a striking feature of the Napoleonic battle. I think this could be dropped (it doesn’t feature in Fire and Fury or Age of Eagles). There is a case for not removing units reduced to a single base, but consolidating them into rump units to fight a rearguard with, but that is something else, and an extra complexity we don’t really need. I think I’m really on to something with this adapted BBB. What I need to do now is to work on my 15mm armies to make them look a bit smarter and extend them a bit, especially the French. It would be fun to have Austrians and Russians too, but that’s a long way off! I still have unfinished business on my 1943 troops. After playing two games with very limited house rule adaptations (after my first with a more ambitious version that I didn’t think worked), I have plucked up courage to produce something more ambitious. After a limited play test I think they work well enough to publish here. I won’t be using them at the club for another couple of months, as I will be travelling, but while production is fresh in mind, I though I’d post something here. In my test I thought they worked surprisingly well. You can download from the Rules page. First of all: scaling. For the standard scale of 1,000 infantry to a base, cavalry is now 333 to a base (from 1,000) or 12 guns (from 24). For the higher scale (1,500 infantry to a base) that gives 500 cavalry and 18 guns. For 1815 French and Prussians I find that an in between scale works well: 1,250/416/15. I am tempted to take the artillery scale down further, but that’s enough for now. Why? Cavalry takes up a lot more space than infantry (indeed I can only squeeze two cavalry miniatures on to the 25mm square bases, in place of six infantrymen). In the von Reisswitz Kriegsspiel (of 1824), an infantry battalion of 900 men takes up the same frontage as 375 cavalry or 10 artillery pieces. The lower scale gives much more scope to represent the variety of cavalry types, and stops them looking rather pathetically few. The British Union Brigade at Waterloo can now be its own unit of 4 bases, rather than being lumped into with the Household cavalry as a 3 base unit. And with French cavalry divisions having strength of 1,500 to 2,000, these are at the margin as two base units. Likewise artillery took up a lot space, and under BBB it is possible to create unrealistic concentrations of strength with devastating results. It also allows us to represent the different sorts of artillery (horse artillery, heavy guns and howitzers) more easily. The next problem is that game progress is slow, because base removal only happens in quite extreme circumstances. The most common close combat result is for one side to fall back 3in with neither side taking a loss. This means that battles seem to be much slower than the time rate of one hour per pair of moves suggests. In fact Napoleonic divisions had a habit of disappearing after two or three hours of heavy combat. this wasn’t particularly from casualties, but sheer exhaustion. Muzzle loading black powder weapons made a big noise and packed a nasty recoil, and barrels got hot and clogged. Horses weren’t great on stamina either. If you look at the later stages of Ligny, after about three or four hours of fighting, neither side had many effective fighting units left. The same thing can be said for Waterloo. Under current BBB rules it isn’t hard for Lobau’s outnumbered corps to hold off Bulow’s Prussians for hours; historically they made a rapid retreat after about one hour. 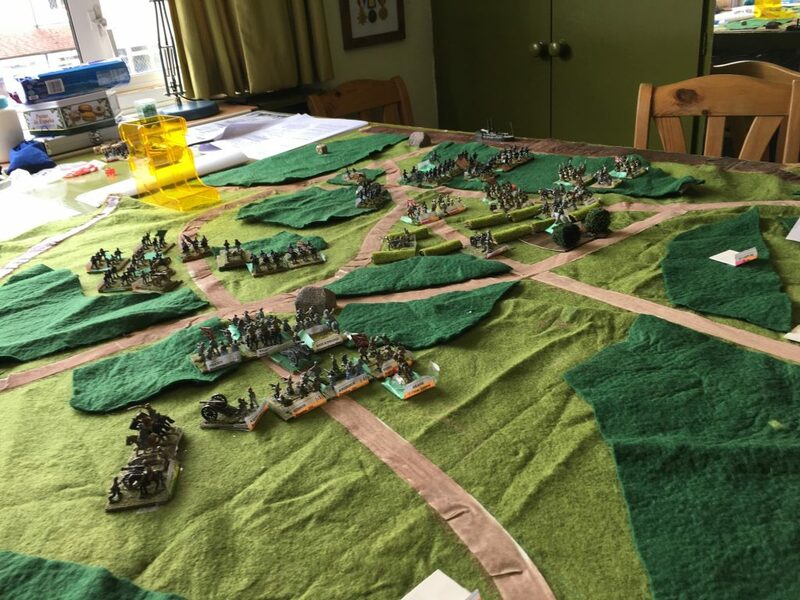 The way I have tackled this is in the close combat table for infantry, where for marginal victories in either direction both sides lose a base. To balance this slightly, for a draw (where under the rules both sides lose a base, and go on to fight another round), neither side loses a base (the attacker falls back). Since infantry units are typically four or six bases, it means that the units will start to disappear rather quickly in heavy fighting. And because both sides lose a base, some of the capriciousness of base losses is removed. This is exactly how combat tended to work: both sides tended to get worn down quickly. Cavalry v. cavalry combats use the old table, as I thought this worked better. Cavalry battles had a tendency to go on for quite a time. Usually one side or other was playing for time, and it was quite easy for skilled commanders to slow things down by holding back reserves and such. Casualties were few. This is something wargames rules tend to miss. The next point to tackle is cavalry attacking infantry. This should have an asymmetric feel that the BBB system mostly misses. When things went well, cavalry could be absolutely devastating (look at the charge of the Union Brigade, or Kellerman at Marengo). But when infantry was prepared it was often ineffective. To tackle this I have done two things. First is a new combat table for Cavalry attacking infantry, in which the asymmetry is reflected. Like the new infantry table, it is quite bloody. Attacks on infantry did wear down cavalry more than attacks on cavalry. And although infantry casualties tended to be low if discipline was maintained, muskets were still discharged and the stress doubtless took its toll. Still infantry won’t lose any bases if it wins or draws. But if it loses on a -7 result, the unit is gone. Also the infantry doesn’t fall back if it isn’t destroyed. The second thing was to introduce the square. This doesn’t necessarily mean that the whole unit is in squares – it is more a state of readiness for cavalry attack. Squares move more slowly, are more vulnerable to fire, cannot skirmish and fire less effectively – but they offer better protection against cavalry.This has the advantage of fitting with players’ expectations, and making the game feel more Napoleonic. Also cavalry get an extra bonus if they are attacking disrupted troops – but they can’t attack infantry in difficult terrain. The next thing is skirmishers. I hesitated on this – as my preferred approach requires some rather intricate rules. Units with skirmish capability have two or three skirmish bases (the same frontage as a normal base, but shallower and with two figures, not six). To use their special capabilities they have to be deployed in front of the unit. Small arms fire is limited to 3in (not the 6in of our previous rules). Skirmishers thus extend the range of fire for infantry, and shield the parent unit. If skirmishers take what would normally be a Disrupted result, there is no disruption but one skirmish base is lost. This means that skirmish attacks will burn out, and take a toll on the resilience of the whole unit. Finally, skirmishers can’t be used against cavalry. And then artillery. The fire factors had to be taken down to reflect the smaller unit size; also there are slightly different capabilities between Horse, Field and Reserve (i.e.heavy) artillery, and the option of using concentrated howitzers (that’s an indulgence, as I like having howitzer models on the table). Horse artillery gets a movement bonus, so that it can move at cavalry speed if limbered, or move 6in, unlimber and fire at half effect, for example. More radically the “reduced” and “silenced” status is done away with, in about the only place where the rules are simpler than the original. In place of the former they are simply removed (they are smaller units, remember), and in the latter case they are Disrupted. My fellow gamers never liked the “silenced” rule with batteries limbering up and moving off, and it always felt a bit odd to me. The rule must have been there for a reason originally though, so we’ll see if it really works! Another radical departure is that artillery has no close combat capability. If it can’t stop attacker through fire, it is overrun. Also on artillery there are special rules for artillery attaching to an infantry unit and being treated as a joint unit for target and close combat – which reduces vulnerability to attack. There are quite a few changes, though I have confined them to four pages of text (just).In the play test I thought they worked quite well. As expected, things moved quickly. The French tried a combined infantry and cavalry attack on the Prussians, with two infantry units and one cavalry; the Prussians had one of each (though the infantry had 6 bases to the French 4). At first it went well for the Prussians; its infantry got the better of the French, reducing both units to two bases. But in the process it became disrupted and low on ammo; it hadn’t formed square and the cavalry hit it in the flank. And it threw badly. It was wiped out. In exploitation the cavalry caught a battery in the flank and overran it. The Prussian cavalry then tried to counterattack, but it was held to a draw (both lost a base) and in the second round suffered a -4 and was wiped out. In the next French turn the cavalry then picked off another battery, annihilating the Prussians on that flank. On the other flank, the Prussians attacked but, didn’t press (confining itself to skirmishing), with French cavalry lurking on the flank. One of the infantry units tried to come to its colleague’s aid on the other flank, but too late. This decisive result owed quite a bit to some good dice by the French at the vital moment. But it proved most unwise for the Prussians to press ahead with un-neutralised cavalry to the flank; it felt not unlike Marengo, though following up to disperse the nemy cavalry was a bonus. I thought the skirmish rules played well too, placing some interesting choices on the player. 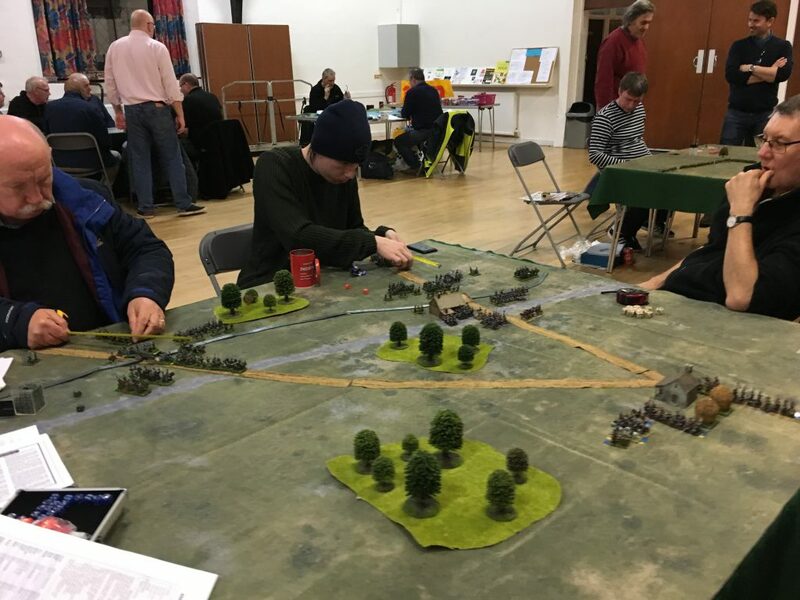 With players thinking about vulnerability to cavalry, and whether or not to skirmish, the whole game felt much more Napoleonic. It also played briskly. My main doubt now is whether cavalry becomes too dominant. But so far, so good. Until now I have never really thought that an adapted BBB might do in place of my home grown ones. I’m a bit less sure now!